The Storm is the "mage" of the Javelin suits, and is capable of surviving for considerable periods of time. Unlike its peers, the Storm excels at aerial combat and spends a great deal of its time in the air, bombarding foes from above. Success with Storm is largely determined by your ability to position well, but also master airborne combat. With the ability to hover over the battlefield, the Storm Javelin remains vulnerable to targetted fire, and with minimal armor, its aerial prowess is both a help and a hindrance. With many of its abilities consisting of area of effect attacks, Storm is brilliant for softening up groups of enemies, while offering particularly high damage. 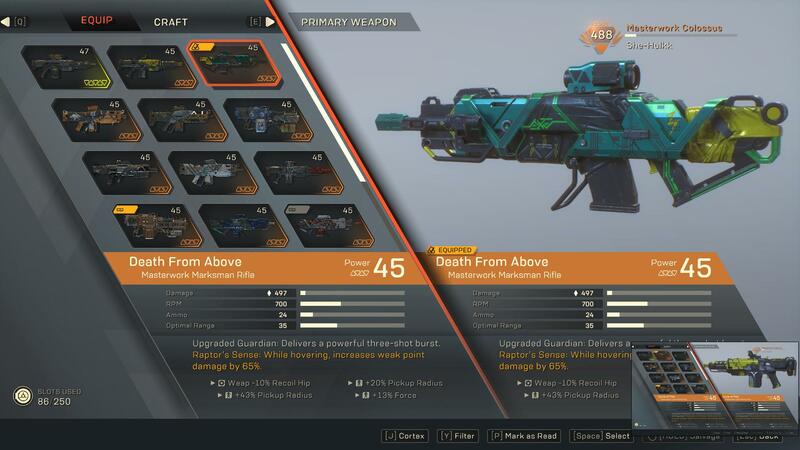 Unsurprisingly, much of this potency comes at a cost, and despite some tools to mitigate damage (such as Wind Wall), the Storm Javelin is undoubtedly a glass-cannon. Hovering is an incredibly important part of the Storm Javelin's play, as it allows him to fly over the battlefield without risk of his exosuit overheating. Depending on how high you fly, you can then hover by pressing [C] at your desired height. Once there, you can move around the battlefield to freely aim your abilities, and shoot at enemies. Just be aware that your movement speed is slowing when hovering, and you can still be brought back down to earth. It's also important to note that while hovering, you can teleport by pressing the dodge button [Mouse 1]. This makes you particularly hard to pin down in the air. Firey Strike (Melee) - Allowing the Storm Javelin to knock enemies back and shock those who get too close, Firey Strike is an instant melee attack that deals high damage. The knockback is invaluable for allowing Storm to reposition and get airborne once more, and is quick. Just be conscious that there's a slight delay on the animation recovery where you're vulnerable to further attack. Elemental Storm (Ultimate) - An incredibly satisfying Ultimate ability, Elemental Storm deals massive elemental damage in a target location. From Frost, through to Lightning and Fire, the total blast can kill just about any enemy, so be sure to use it when there's plenty around. Lightning Strike: A targeted strike that deals lightning damage in an area. Lighting Strike is particularly potent because it deals 50% additional damage to shielding, and as a Detonator, is capable of causing a massive explosion on any primer. Great for clearing a group of enemies who're grouped together. Ice Storm: Creates a field of ice that deals damage, rapidly building to a final explosion of frost. With several charges, you can individually cast each, allowing you to control the primer. Flame Burst: A quick explosion that deals fire damage at a target location. Flame Burst can be cast at speed, or it can be held to exhaust all available charges. Flame Burst is amazing for clearing enemies quickly, but is neither a Primer or Detonator. Ice Blast: Fires out a flurry of ice projectiles that deal damage and freeze close-range targets. Living Flame: A burst of flame energy that seeks out and ignites targets. As a Flame primer, Living Flame is solid, but is let down by the fact the projectile is slow to travel, and slow to seek. The burning effect also isn't immediate and takes a half second to occur. Good for early leveling, not great for end-game. Burning Orb: A versatile fire ability that can be fired quickly in small shots or charged for a larger projectile that explodes. As a detonator, Burning Orb is capable of enormous damage and when you do trigger any Primer, can comfortably wipe the floor with any opposing enemies. Shock Burst: A discharge of electric energy that can be bounced off of walls to reach targets behind cover. To be honest, one to avoid. It's hard to use, bounces weirdly, doesn't deal insane damage, and offers little utility. Glacial Spear: Fires a beam of powerful ice energy in a targeted direction. Arc Burst: Unleashes a blast of lightning that will leap to nearby targets for heavy damage. Definitely great for destroying shields, but without the ability for it to detonate your primers, its value is limited (Storm really needs his combo burst when detonating). That said, early game it's solid and the AOE potential is good (its cooldown isn't too shabby either). Has a charge time. Wind Wall: Allowing the Storm to generate a defensive wall of wind that deflects incoming enemy projectiles, you get to choose where it's placed, and how close/far away from me. Just be conscious about the fact it cannot be used in the air, and needs to be placed on the ground somewhere. Best used to support your Ranger and Colossus against major ranged threat. Quickening Field: Creates a field which provides gear cooldown reduction to teammates who enter its radius. Just be conscious of the fact that for your team to make use of it, you'll have to land. That's not good for the Storm, so just use it in the air and be a little bit selfish. I've been playing with a variety of builds on my Storm lately. Much of my play has been pure experimentation, and the reality is that there's only really one build that's particularly viable and powerful. There are variables, but for the most part, what's listed below provides massive damage, control and burst. When building your Storm, ideally you want to focus on any component which boosts your gear damage, elemental damage, and fire. It really is that simple, and unlike the Ranger, the Storm actually has some really good Masterwork components: you won't have to rely just on Epic versions. Mark of Ruin: While [Q] recharges, [E] damage increases by 20% for 20 seconds. Mark of Wrath: While [E] recharges, [Q] damage increases by 50% for 5 seconds. Elemental Conduit: Increases Elemental damage by 35% of base, and decreases physical damage by 35% of base. Stom Combo Augment: Increases number of combo chains by 2. Elemental Synergy: Increases gear damage by 50% of base and lowers gear recharge rate by 20% of base. Ice Storm (Winter's Wrath): Ice Storm is amazing because it's not only a powerful primer, but Ice as an element deals 25% additional damage to shielded enemies. Not only that, but the bonuses of Winter's Wrath allow you to restore its charges, and ensures you get regular up-time on the ability. There's only really one choice, and it's Quickening Field. Allowing the Storm to lower their cooldowns by 20% for its duration, it's significant over the course of a boss fight, and allies can also benefit from it. 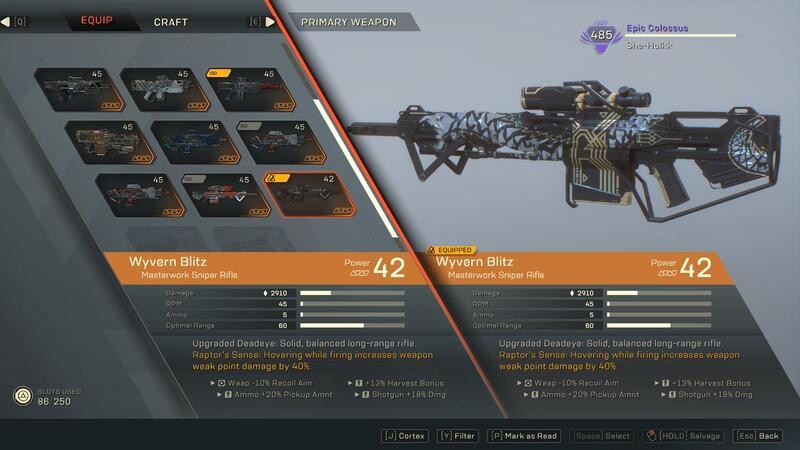 It helps with ability up-time, and if you land lucky on a roll, can see you gain significant bonus damage to your gear as well (mine has +25% damage on my Q at the moment, so I'm unwilling to give it up for an Epic variant). In an ideal world, you want to be locating a Wyvern Blitz and Death From Above. Both offer massive damage potential when hovering, allowing you to deal huge burst when high in the air. Considering as a Storm you should be spending 99% off land, the bonuses of 65% and 40%, respectively, are enormous. Most of your damage will still come from your abilities, but when they're on cooldown, you need to be firing constantly. Burning Orb (Ten Thousand Suns): Allowing the Storm to stack huge damage bonuses when he explodes his [Q], Ten Thousand Suns provides an enormous damage boost, that's capable of allowing you to deal outrageous damage if you reach the stack limit, and have your Ultimate ready. 1. Remember that the Storm has very poor defensive capabilities. Use its damage to pressure, but don't be afraid to retreat. 2. Next to the Colossus, the Storm is the second least agile exosuit. 3. The Storm has a single jump ability to provide increased air time, effectively allowing it to hover over the map. Hold space to increase the air time. 4. At full power, your Ultimate ability - Elemental Storm - makes you immune to damage. 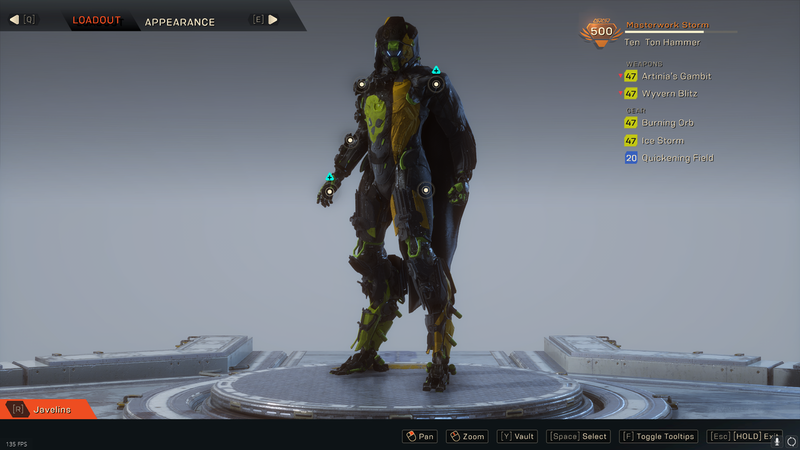 Unlike other Javelin, it's also a primer and detonator. 5. You can float as a Storm to slow your descent. Just tap space, or hold it to extend the float time. 6. You can jump further as the Storm by sprinting, before jumping. 7. Unlike other Javelin, the Storm can teleport instead of dashing. 8. The Storm's shield when active ensures he can't stumble when hit. 9. If you're hovering, your shield is increased, and receives reduced damage. 10. To hover, hit [C] when you're airborne at your desired height. To stop hovering, hit [C] again.